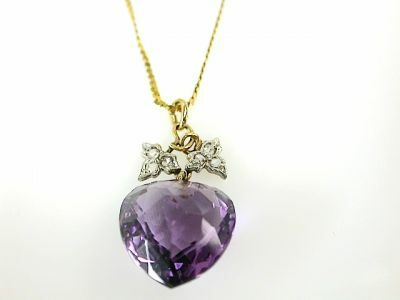 A wonderful heart facetted cut amethyst, est. 14.00ct (clarity:LI & colour:medium purple with slight grey hue) and 6 bead-set rose cut diamonds. est. 0.08ct (clarity: SI & colour: H-I). There is a 10kt. yellow gold serpentine chain which is 16 inches (40.64cm) long.